Buttery, herby oysters, sautéed and roasted under the broiler. Combine the breadcrumbs and Parmesan cheese in a small bowl and set aside. Melt butter and add olive oil over medium heat. Sauté shallots and garlic in the butter/oil mixture until they are wilted. Add the oysters, herbs and cream and heat until the oysters just start to firm up. Remove pan from heat. 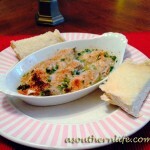 Place oyster mixture in a casserole in a single layer or in 2 individual oven-safe pans. Spread breadcrumbs over the top and broil in the oven for 5-6 minutes until the breadcrumbs are toasted. Serve while hot with hot, crusty french bread. Oysters grilled with butter, garlic and loaded with flavor. Prepare your grill for grilling with charcoal. While the charcoal is getting hot, shuck one dozen oysters. Shucking the oysters was the hardest part of this recipe. Get a good oyster knife and be careful. There are lots of tutorials for how to shuck oysters on the web. Try not to lose too much of the oyster juice as you are shucking. I relegated this job to my husband while I prepared the butter sauce. Melt 2 sticks of butter and add a couple minced garlic, a tablespoon of finely chopped shallot, a dash of Worcestershire sauce, a bit of salt and pepper and a splash of hot sauce. Whisk these together. When the coals are white hot, place the oysters, shell side down, directly on the grate. Let them cook until the juice just starts to bubble a bit. Pour the melted butter mixture over each oyster (be careful here because when it spills over the fire will flare). Sprinkle a bit of Parmesan, Romano and Asiago cheese blend on each oyster and grill until the cheese is melted. The total cooking time for us was about 5 minutes.